I have loved lichens for as long as I can remember. I have always found the large and colorful rosette shapes they form on rocks beautiful. Thirty or so years ago, I wowed a group of teachers while taking a Project Learning Tree training course. For my introductory science question, I asked them to identify the entity composed of a symbiotic relationship between a fungus and an alga. So, when I started designing an after school schoolyard habitat series for young students, I naturally included a session on lichens. Along with the bird books which were meant to make me an expert for the birding session, I bought two normal size lichen books (this is meant to distinguish the books from Lichens of North America, a massive volume, which I finally bought this month). I realized almost immediately that I wouldn’t be able to be enough of an expert on birds to do any kind of session, partly because birds move. You might not find any at all! What you do find may be moving too fast to see with binoculars, let alone to see long enough to identify with beginning birding skills. It’s better not to be embarrassed in front of my little third and fourth grade students! So I concentrated on creating a lesson about lichens. Lichens don’t move, and I could theoretically scout my lichen hunting sites out in advance, make identifications, and be prepared to wow my students into loving them as I did. Of course it didn’t happen that way (there’s a Steve Forbert song, “It Isn’t Gonna Be That Way” playing in my head as I recount this)! I never found the time to do the advance scouting. I made sure I knew a place that had lichens, but I didn’t do any ID. Of course, I needn’t have worried. Not only was I miles beyond my third and fourth graders, so they didn’t notice any lack of expertise, but really, what they wanted to do was make little movies in the garden with the iPads again. And not even movies about habitat or plants, but featuring little stuffed animals! It was an after school program after all. 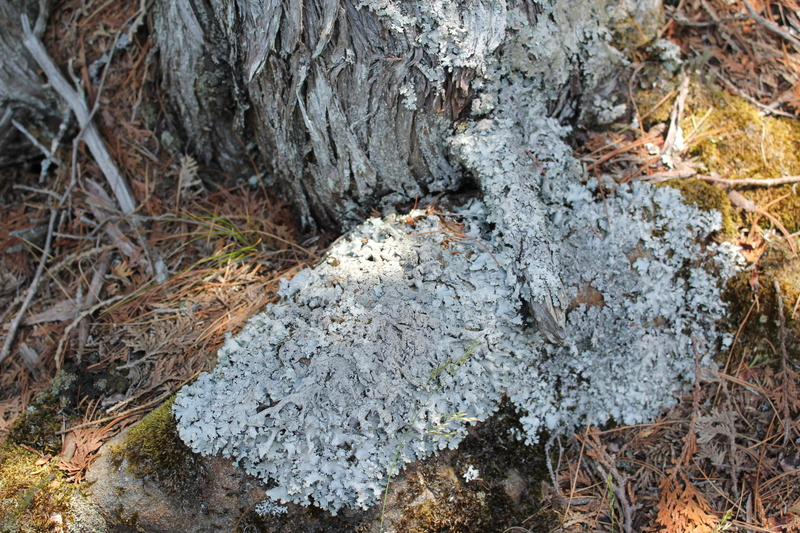 This teaching experience had taught me that my lichen ID skills were rudimentary, so for my next student lesson, I persuaded a local lichen expert to come out to one of the schools that I work with to do a lichen walk in our “community forest.” He even brought a microscope, and gave each student a look at several different lichens. It was on his recommendation that I headed off to Maine for a week in June, to an intensive course on lichens at the Eagle Hill Institute (link and a description, below). It was on the first day, I finally had to face the supremely underestimated profundity of my ignorance. I didn’t even have a clue about good naturalist hand lenses, and had to go to the office to buy one immediately (they didn’t have the lighted ones the instructors recommended). I had not used a microscope myself since 9th grade biology, and had never dreamed how much skill that required. Out in the field, I collected lichen specimens in small brown bags as feverishly as any of my colleagues (none of whom were the rank beginner I proved to be), but my notations on each bag were sketchy, since I figured I would do identifications back in the lab. After the first night, when I found I couldn’t understand the difference between isidia and soredia and other lichen structures, or apply the dichotomous key well enough to identify my specimens from scratch, I made sure to carefully write down whatever name the instructors said in the field as we were collecting. That made it somewhat easier to make correct identifications back in the lab and let me play around with looking for whatever structures the book said that kind of lichen was supposed to have. This experience not only challenged me to sharpen my lichen identifying skills, but also left me with another positive end result. My preconceived notions about symbiosis were upended, leaving me with a whole new understanding of and appreciation for what I thought I already knew. I’ll explain more in a future post! Eagle Hill Institute, in Steuben, Maine, offers weeklong and shorter courses/seminars on lichens, birds, bryophytes, and a host of other nature topics. See http://www.eaglehill.us/programs/nhs/natural-history-seminars.shtml. My week was intense but thoroughly enjoyable, the food is great and the accommodations are rustic but fine. During my lichen week, there was also a group of people studying bryophytes, including a 12 or 13 year old prodigy who had already been volunteering at a natural history museum in Chicago. He was always the first one to head back to the lab for specimen identification after dinner.